The Clothing and Textile Competitiveness Programme (CTCP) has received an overwhelming vote of support from one of its beneficiaries, Durban Overall. The business epitomises the challenges that the local industry suffered as a result of competition from cheaper imported goods: the company was operating at the lower end of the value chain, it was losing margin because it wasn’t always selling directly to customers, and there was doing too little to boost the skills of its workers. All this changed, says company CEO Steve Tandy, when the CTCP incentives were introduced to reinvigorate the industry and make it competitive against the threat of cheap imports. “Through the IDC taking us through this new journey of training and reaching a quality control that catapulted us into the global market has added a new zest, not only to myself as CEO, but also to the whole company,” he says. This spark of new energy was desperately needed for a business that was underperforming in terms of its productivity and market penetration. Tandy says that while it had grown from humble beginnings of just 12 machinists to 280 staff making garments on behalf of a third-party, it was at the mercy of market forces and suffered when the industry took a turn for the worse in the 1990s. 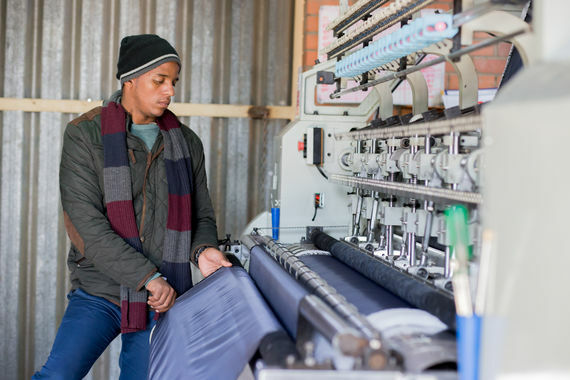 “The IDC and DTI programmes for the textile industry is perhaps one of the best initiatives that they could have developed for the South African industry,” Tandy says. One of the key interventions that he says made a tangible difference was the concept of introducing clusters of manufacturers who were encouraged to collaborate and jointly boost the textile manufacturing supply chain. This included the sharing of best practice processes that helped to elevate all participants. On the back of this new-found energy, Durban Overall also took advantage of the funding incentives under the Production Incentive Programme (PIP) to buy new machinery, and invest in staff training. Tandy says the improvements it was able to make catapulted it from around 10th position locally in the workwear segment to within the top three in the country. Among its achievements was securing the SABS mark for its overalls, as well as ISO 9000 accreditation for quality management and assurance. These approvals and its BBBEE status enabled it to compete for, and win, tenders to supply to government. This growth and confidence in its abilities enabled Durban Overall to step in and acquire two clothing companies that were in dire straits. My Jeans and Excel Clothing were therefore added to the group. It would not be an exaggeration to say that Durban Overall would be a very different – possibly even defunct – business had it not been for the CTCP. The company’s expansion into export markets within SADC, alone, are a mark of this turnaround. Tandy says the company supplies its workwear to some of the biggest mines in countries from Mozambique, Zimbabwe, the DRC, Botswana, Namibia and Tanzania.